Neither rain, nor snow, nor sleet, nor hail keeps the dedicated supporters from coming out to the Ride for Heart. Like the old saying goes, neither rain, nor snow, nor sleet, nor hail keeps the dedicated supporters from coming out to the Ride for Heart, the largest charitable cycling event in Canada, every year. 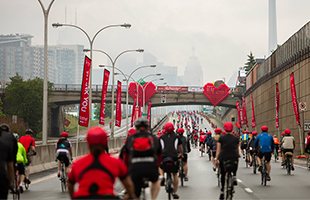 The Heart and Stroke Foundation (HSF) event takes place in early June and while Toronto is probably safe from snow at that time of year, there have certainly been some pretty rainy rides. Tom Cordery, long-time captain of the Desjardins Insurance Ride for Heart corporate team, remembers one wet day in particular. "It was 2010," Tom remembers. "That was the year that I decided to become a VIP rider." That's how HSF recognizes anyone who raises over $1,000. "To get my colleagues, friends and family to donate, I promised if I raised $1,000, I would ride an old-fashioned Raleigh Roadster bike, in dress pants and a blazer." "People who've done Ride for Heart every year tell me this 2010 ride was the second wettest on record," Tom laughs. "I was pretty wet through, water squishing out of my shoes, the whole bit." "I love feeling so free.Cycling in a safe environment, not having to watch out for cars...It's a great feeling. Everyone is having a good time, chatting and meeting new people as they ride." Aside from a desire to create memorable experiences like these, many participants have a personal attachment to the cause. Tom's inspiration is his own father, who was diagnosed with blockages in his heart when he was in his 60's and was waiting for a stent to be placed when he had a minor heart attack. "Thankfully, he got great care and was followed up well and had many good years of life afterwards," relates Tom. He knows that the quality of care his dad received is due in part to organizations like HSF, who fund research and innovation in treatment as a core part of their mission. For Tom, another component of their work is critical: "They raise a lot of awareness. Understanding the risks, the importance of prevention - it's a really important part of what they do." Still, what first drew him to the Ride was simply the ride. A life-long cyclist, Tom saved up his own money for his first bike when he was in elementary school. But it wasn't until he came to work at Desjardins that he connected his favourite sport and his personal commitment and became involved in the Ride for Heart. "When I realized that Desjardins was involved, I joined the Ride and just kept coming back," says Tom. He served as captain of the team for about a decade, before passing the baton last year. And who caught it? A relatively new Desjardins employee: Joana King. With a similar love of cycling, Joana was also drawn to the fun of the event. She says that when she joined the Desjardins team, "I just wanted an excuse to ride my bike on the DVP!" Infamous to Torontonians for its traffic jams, the Don Valley Parkway is more familiar as a place to sit and fume in your car, than for energy and excitement. "I love feeling so free. Cycling in a safe environment, not having to watch out for cars...It's a great feeling. Everyone is having a good time, chatting and meeting new people as they ride." But for Joana too, the cause has become very personal. "My dad started suffering from heart failure and then two years later, he had a heart attack. While he was in hospital recovering, he had a stroke and ended up being transferred to Toronto Western Hospital to have surgery to place three stents in his brain." Her dad's illness is very recent and Joana is still processing everything that's happened, but she has already realized something. "I am so grateful that we live so close to world class medical and research facilities. My dad is alive today because of our proximity to amazing hospitals that can take advantage of the latest research - which is only possible through fundraising." Joana's dad received exceptional care from a team lead by Dr. Frank Silver. "Dr. Silver met our family with the ambulance in the early morning hours following my dad's stroke," remembers Joana. "He explained what was happening in a way that was easy to understand, with unmatched sincerity and compassion that really impressed us. I am certain that his team saved my dad's life, and I will always be so grateful to him for that." Desjardins Insurance has sponsored a corporate team for Ride for Heart for many years, but the company's commitment does not end there. Desjardins has partnered with the Heart and Stroke Foundation in many different ways over the last decade, from sponsoring the VIP Tent at Ride for Heart, to supporting e-tools such as the Risk Assessment , which helps people understand how the choices they make can impact their health. "Desjardins partners with the Foundation in meaningful ways," says Nicole McVan, Director of Corporate Partnerships with HSF. "They are willing to engage in a way that deepens the relationship beyond just simply handing over a cheque." For Tom and Joana, it's very simple. They're looking forward to the early morning in June when, come rain or shine, they pull out their bikes for a unique ride and a special way to celebrate their dads.